Raleigh NC Drainage Pros Can Help You! 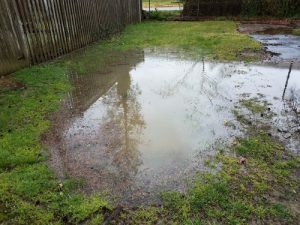 April will be here as soon as you blink your eyes and Raleigh NC Drainage experts, Outdoor Pros, knows how much of a pain all the rain can be if your yard isn’t property draining. You know the saying, April Showers bring May Flowers, but you don’t want to be stepping in puddles all April trying to plant your garden. Outdoor Pros can help transform your muddy, soggy yard into a dry and family friendly area to enjoy the fresh air. Outdoor Pros has 25 years of experience and the knowledge to help you fix a number of problems. We also help install all types of drainage systems, including catch basins, French basins, full drain fields, embankment stabilization, channel/strip drains, and down spout piping. Whatever your erosion or drainage issue, we can help. We also offer modification and repair of drainage or erosion systems. 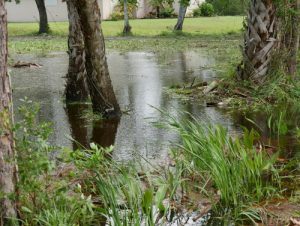 Let us help get your Raleigh NC drainage problems under control. If you have lawn and landscaping issues outside of drainage or erosion, Outdoor Pros can help you with that as well. We offer services from landscape installation to custom concrete. Let Outdoor Pros help you with the outdoor living space of your dreams. Whether you want to make a few additions to your back yard or do a landscaping overhaul on your front yard, we can help plan, execute, and maintain your new project. Your yard, your property, are where many of your memories are made. Outside, in the fresh air, you’ll play games with your kids, plant a garden with your wife, drink beer with your buddies, and more. Don’t settle for second best. Call Outdoor Pros to see how we can help create the atmosphere of your dreams. We look forward to learning more about your project and creating the outdoor environment you desire. Call us today! What was once an eyesore and unusable is now the favorite part of our home. Jay and his team have brought our vision to reality. We couldn't be happier with our experience. Linda M., Raleigh N.C.